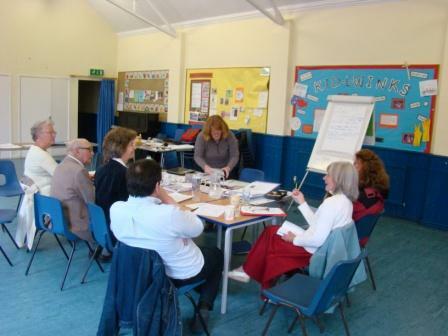 The first group meeting took place on Sunday 25th April 2010 – meetings were originally held at Shirley Parish Hall but later in the ParkLife Community Room at St.James’ Park. The life of Andrew Barlow, a Victorian philanthropist famous locally for renovating the Barlow and Ellyett Homes on Church Street. He was also a resident of Oatland Lodge which used to be opposite the park on the corner of St.James’ Road and Winchester Road. We plan to share his story during the public talk series of Autum 2010. Postcards of Shirley, particularly of the Park. Nathaniel and Catherine Jefferies, local Victorian philanthropists, and their links with the Park. Local architecture and its conservation. George Harris, builder, farmer, brickworks and gravel pit owner. Links with Old Shirley and Admiral Sir Charles Bullen, last surviving Captain at the Battle of Trafalgar, who died at Trafalgar House, Shirley in 1853. The Didcot, Newbury and Southampton Railway 1881-1884 and local links. The life of a child – changing times. This topic is being undertaken primarily through the Oral History Project, including play and school days. Memories of Shirley School – again, through the Oral History Project. The Park in World War II – its ARP history. We’d like to thank everyone who offered help with our research to date – the generosity of people who donated books, materials, or information was overwhelming. The Group had its own Facebook page, kindly set up by the FoSJP webmaster. Everyone within the Group was encouraged to use this as a tool for exchanging information and ideas. FoSJP was asked by Southampton City Council’s Conservation Team to contribute to the latest revisions of the St.James’ Road Conservation Area Document. The Group aimed to uncover information which would feed into this document and its aims. We were particularly interested in receiving copies of deeds relating to Didcot, Newbury, and Stratton Roads around the Park, and from the houses that would have been on the proposed route of the Didcot, Newbury and Southampton Railway, to establish whether or not the railway actually bought the land around 1881. After the completion of the Shirley Heritage Project in 2015, the members of the FoSJP History Research Group decided to establish the Shirley Local History Group to both continue and extend historical research beyond the immediate environs of St.James’ Park. Please visit our History News page to find out more!